How To Make Your Next Hawaiian Vacation The Most Memorable Event Of Your Lifetime! For Over 50 Years Now, The Only People Who've Had Access To These Local Island Home-Town Secrets Was A Small, Closed-Door Group Of Marketers (With A LOT Of Cash) Who Used Them To Build Enormous Fortunes -- Without All The Tedious "Grunt Work" Everyone Else Was Being Forced To Endue. ... And Why The Local Traditional Out-Dated Methods Of Tourism Marketing Are Literally Self-Sabotaging The Hawaiian Tourism Industry Itself. Joe maintains over 200 websites in travel, shopping and other businesses to his credit. Let me ask you a couple questions... and be honest when you answer them. #1: Do you despise seeing one person charged a lower price on item that you both just stood in line and bought and yet see another being charged even less? #2: Are you tired of trying to get prospective businesses to give you a fair rate on an event that you want to patronize, knowing those whom you're trying to deal with couldn't care less about your personal wants, needs, or desires? #3: Are you sick of being told to "Just stand in line and wait your turn!" when it's obvious that what they should be doing more of is catering to your every want or need to get your return business? #4: Have you been hard at it for months (even years) saving for that perfect vacation only to be hugely disappointed with the service that was rendered when you finally got here? This May Be The Most Important Savings Message You'll Ever Read. Odds are very good that, if you're currently in the process of making plans to visit Hawai'i or if you've already vacationed here, you're either banging your head against a wall right now, or did in the past, trying to make simple affordable vacation arrangements for the things you want to do while you're here. Only to be given bad advise, sent to the wrong places, herded and corralled like cattle, fed from buffet lines (that are not normally fitting to eat), and then released two hours latter while you're scratching your head wondering what you just paid $150 per person for; or what you did wrong in the process to be ripped off like that. Odds are also very good that you're needlessly doing so. Frankly, tourism is extremely low in Hawai'i and getting worse as each day passes. One of the most gorgeous spots on the planet, where tourism is the major industry, is being ruined by local hustlers on every corner. A few weeks ago I spoke with two local gentlemen at a local establishment who were both raving about this very subject. They told me that when they were growing up, Wiakiki would boom all night long. Now the streets are vacant by 11:00 PM. They also added, that you can not stay in Ko'Olina for less than $400 per night with breakfast costing at least $60 per couple. As they went on with their story, they commented about how local officials are allowing every tourist to be run off by constant the hustle. "We just got back from Cancun," they added. We flew first class, stayed at a first class resort for over a week, everything was free, including all of our dinning and the cost was $900 dollars each. Why would anyone want to come to Hawai'i to vacate when you can get VIP treatment like we just received. "You cannot stay two nights in Ko'Olina for that price.....it's just gotten totally ridiculous....Hawai'i is going to have to revamp their entire tourism strategy to compete with the rest of the world or no one is going to come here." As I sat and listen to all these two local boys had to say, I had to put my two cents worth into the equation. I started talking about the many injustices I had seen myself with the tourism populace. What if I told you that because you don't live here in Hawai'i, you are charged premium tourism prices, while local residents receive 20% to 50% off products and services. This is what's known as the Kama'aina rate. Worst yet, if you're in the loop, you can get an even bigger discounts if you have culture ties to these local vendors. It's like you and I both walk into Wendy's and order a single with cheese and I pay $1 and you come right behind me and have to pay $2. Now, I ask you - I this fair because I'm dressed different than you are? Or because I talk a little different than you? Of course not. No one wants to be treated like that. Simply put, It's just WRONG. I'm not saying that Wendy's actually practices this type of business. It was just using them as an example....It could be any establishment. Kama'aina is a local term meaning, in it's simplest terms, "local resident'. Local Government's and taxing authorities seem to endorse these, or what I call, discriminatory behaviors. For instance, let me give you an example. All you need to do to become a local resident is to get yourself a Hawai'i drivers license or Hawai'i State Identification Card. This automatically qualifies you for significant savings practically on every event in Hawai'i if the local vendors offer a Kama'aina rate. This practice has been going on for decades now. Frankly, I find it very offensive in nature and do not agree with it whatsoever. It's price gorging with the tourist populace and turning people off from re-visiting Hawai'i. I have a cute little story to relay and I certainly do not mean any disrespect whatsoever with I'm I about to quote. In fact, I laugh about it on a regular basis. It must have been or was just by pure luck-of-the-draw that approximately 5 to 6 years ago I decided to go see "The Don Ho" show. When I was a kid, I use to love to watch his TV show and could wait for "Tiny Bubbles" to start. I remember my Grandmother always humming the "Pearly Shells" tune. It was a pleasant day in the early afternoon somewhere around late 2003. For several months I had been taking my usual Waikiki Jungle walk, which encompasses passing the Beachcomber Hotel where Don Ho's banner was still hanging outside. On the banner was a picture of Mr. Ho, as I had remembered him in the 1960's when he had his TV series. So, in my minds-eye, that's how I still envisioned Don Ho - young, black hair and a very talented singer and actor. I had stopped downstairs at the Beachcomber and asked some gentleman where I could purchase tickets to the Don Ho Show. He noted I would have to go upstairs to get them. So, I proceeded upstairs as instructed. On arrival, no one was standing outside at the time selling tickets, so I politely called out "Hello, is anyone here?" An elderly gentleman stepped out from behind the wall and proceeded to help me make arrangements for my seating. You basically have two rates (or so most people think) - one being a Dinner Show rate which allow patrons in early, with better seating closer to the stage. The other being just the show only rate. So, I told this gentleman that I would eat elsewhere and only wanted to see the Don Ho Show - I also noted I hadn't seen him since he was on TV in the 1960's. While I cannot remember the exact amount, he roughly quoted $30+ each for the tickets which was much to my surprise. I said Sir, I'm not a tourist, I live here. He said: "You local boy, hu? I replied yes sir. "Let me see ID", he said. So, as instructed, I showed him my Hawaiian State ID and Drivers license both. At this point, he must of sensed I was somewhat offended about the double dealing going on. He politely said, "You local boy, give me $23 each for tickets." I'm thinking ok, he just playing with me and besides it's his job to get as much as he can for every ticket sold. I left the scene to get a bite to eat only to return just before the show was starting. I took a seat at almost the very back, pretty much by myself. The pre-show was just getting underway at the time and a waitress brought me over a glass of Champaign, of which I did not order. As she sat the drink down, she said Mr. Ho said to give you this. Much to my amazement, I said, "For what?". I don't know, he said to bring you the drink over here. At this point, I'm seriously getting anxious wondering what in the world is transpiring. Where is Don Ho, I'm thinking and looking around. I don't see him anywhere. Why is he sending me a glass of Champaign? Finally, the pre-show was ending and the MC was leading into Don Ho's entrance. This older gentleman, with long, thin, blondish strawberry looking hair slowly works himself up on stage. Much to my surprise, it was the same person that sold me my tickets. I remember feeling about as big as an ant. I remember thinking - I've waited 40 years to see Don Ho and I certainly made an outstanding first impression - arguing over the price of his tickets to the man himself. After the show, I hung around to the very last to make an attempt to apologize. Mr. Ho would sit in the lobby signing autographs until the last person left. While standing at the back of the line, I picked up two CD's to get him to sign. As I approached him for the last signature of the night, he again uttered, "There's my local boy from Kunia." I remember saying something to the affect of "Mr. Ho, you've got a clear head.....you could have told me that was you earlier." He laughed, and so did I. It was the way he laughed that made me feel more at ease and he said - "Ain't No Big Thing." He signed my CD's and he invited me back down again. I would at times, just drop in every 6 months or so just to watch the show and so hello afterwards. Over the years, I noticed that Mr. Ho had this special quality about him, that really attracted people to him. He was always kind, and generous -- and, I might add, very unpredictable. He may be playing with you one minute and have you on the stage singing "Tiny Bubbles" the next. The last time I spoke with him, was in late 2006. I again attended his show. At the end, as always he was outside signing autographs and I said. Mr. Ho, I've always wanted to sing "Tiny Bubbles" on stage, just one time before I depart this world. I said, one of these days I'm going to do it - but give you full credit of course. I still remember very well his remarks, he said: "the next time you come down to visit and I start to sing it, just get up and walk on stage and help me sing it." He said, "I love surprises like that. I promise you that you will not make me mad at all. So, if you don't do it, it's your own fault because the offer is in your lap now." I made a comment, "don't be telling me things like that.....I'm the type that will get up and take over the whole show......" he replied - "that will be just fine." The story ends here, Mr. Ho past-on in April 2007. And, I never got to sing "Tiny Bubbles" to this date. I really miss that guy, even though I only knew him in a very small context, he was always fun and entertaining....and I never knew what he would do next. I assume that's where he got the title of being "The Wild And Unpredictable Don Ho". The moral of the story is that there are different rates for everyone here in Hawai'i - practically at every establishment. It's been going on so long, it's like human nature to many vendors - especially the ones that were born and reared here. If you even look like a tourist, you're automatically given or charged a higher rate. If these articles I touch the upsets local vendors and other people here. Well, it bothers me also. I'm simply of the opinion it's discriminatory in nature and needs to be abolished for the good of Hawai'i in general. It's not an effective way to market Hawai'i or to get people to return here for their vacation needs. People can sense when they are being taken. It leaves a bad taste in their mouths and an invitation to go elsewhere when they are planning their next vacations. So, this is what this opening letter is all about. 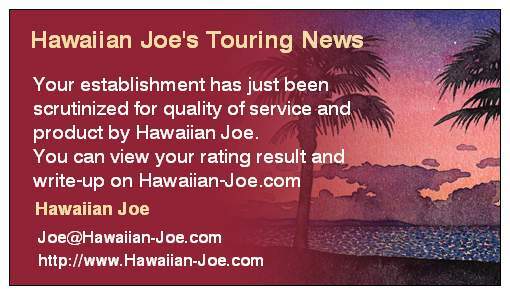 To give you the needed information you need to make good decisions on your visit to Hawai'i. I strive to give you information on many events, attractions and places to stay that are trying hard to please customers. I visit these establishments every day. I fly to the other Islands just to visit establishments. I do, at times, introduce myself to Hotel managers to see what prices they charge tourist and to see if it's reasonably priced. I want to know, with first hand knowledge, if my endorsement go on it, it will be of value to my readers. Can I stop the different pricing, not hardly at this point, but maybe someday. All I can do is keep exposing the bad and the ugly sides. But, what I can do is say, Mr. or Ms Hotel Manager, if recommend your establishment to my readers, are they going to be treated fairly. I can plug along, day after day, writing little lines about different places to visit, to eat, places that provide living accommodations while here and host of other things that will improve your stay in the Hawaiian Islands. I expect and demand nothing less than to be treated fairly. I've had Hotel Managers call me personally or write emails asking for my endorsement. They've all ensured me that my customers will always get a favorable pricing and good service. The one thing I don't do is announce myself while visiting restaurants and other facilities. I just blend in with the tourist to see how the service, shows, food, products or whatever is. I want to see if it's of value for recommendation to my subscribers or bad enough to make my black list of places of not to visit. I'm one that does not take kindly to paying good money for bad service or a bad product. When, it happens, I do eventually get around to identifying it. I put the card in with my credit card when paying the tab. The best part is the look on their faces when they come back to the table for my autograph. They know what kind of service or product they delivered. Based on their own actions or service, they can pretty much figure where the rating is at, along with about what will be said in the write-up. These are my opinions and my opinions alone. I will say, I do everything humanly possible to be as fair as I can without showing favoritisms. And everything in print is as factual as I can make it and still make it interesting to read for informational purposes. My whole objective to expose the bad and the ugly, identify the good, and provide you honest, straightforward information regarding the places to visit, which I think, you will enjoy based on your wants or needs. In my opinion, Hawai'i is the most beautiful place in the world to visit on the planet. There are so many things to do, there is no way anyone can begin to see it all in a two week vacation. Most people have never been here. It's their first trip, and I want to ensure they have the information they need to make the most of it while they're here. Let me give you another example that may help you if you're planning on a trip to here to the Islands. Let's say you're planning on visiting Waikiki for two weeks within the next 3 months. While here, you would love to visit the active Volcanoes on the Big Island of Hawai'i but not sure if it's within your budget. Another service we offer is keeping you informed of cheap airfares, hotel specials, and car rentals, et cetera. Within the last year alone, there have been numerous airfare price wars with inter-island travel. The rates, on many occasions, have been $19 one-way. The problem is that when they price wars are announced, they are only good for approximately 1 to 2 days and must be used within a specified time frame, usually a 3 month or so window. What we do is notify our subscribers immediately that a major drop in airfare has occurred. So, you get the notification, sign-on to the vendor, and purchase your ticket. All the Hawaiian Islands are approximately a 30 minute flight from Honolulu International Airport. So, for approximately $40 each you could get round-trip airfares to other islands during your stay here if you know they exist. However, you have to be quick with your responses. To reiterate, the sales are very short when they occur. Leaving out early one morning, touring the Volcanoes, and returning late that evening on the last flight back to Honolulu. However, you also have to calculate the cost of a vehicle into the budget is my suggestion, or else take a tour bus or guide. Normally, for approximately $40 per day, you can get a very nice vehicle depending on what your standards are. Hawai'i Volcanoes National Park is approximately a 45 minute drive south of Hilo International Airport on Highway 11. Just a note here about the Chain of Craters Road within the Hawai'i Volcanoes National Park. The road has been, at least in parts, recently closed due to recent lava activity. So, it's very feasible and inexpensive, with the right planning, to visit several or even all the Hawaiian Islands during a two week stay in Hawai'i. There's just one Catch-22 to the airfare specials when they are announced. Every special airfare I've seen has to be used from Honolulu's International Airport. I've not seen the specials apply say from Hilo to Maui or Maui to Kaua'i. You always are required to depart from Honolulu. However, even with that restriction, most of the time, everyday fares can be purchased for approximately $39-$59 one-way. While I'm on the subject of the Honolulu International Airport, I recently read an article regarding my friend, Don Ho. Apparently, there is some serious talk of changing the name of the airport to The Don Ho International Airport. Whoever the decision-makers are, they certainly have my support in that endeavor. I sincerely think it would be an outstanding tribute to Mr. Ho and his legacy. Personally, I cannot think of Hawai'i without automatically thinking of Mr. Ho. As someone put it the other day, and I do not remember who it was that said, "Don Ho is the Ambassador of Aloha". He's gone, but certainly will never be forgotten here in Hawai'i. As for myself, I am a Certified State Of Hawai'i Destination Specialist. What that means is just that I've taken several in-depth courses on each of the Hawaiian Islands with satisfactory results. In turn, I was given the certification and a nice certificate to hang on my wall that says the same. I also have two Master Degree's, a Bachelors, and two Associate Degrees. I've spent more than the last 30 years in information systems with over half that time with the United States Air Force. 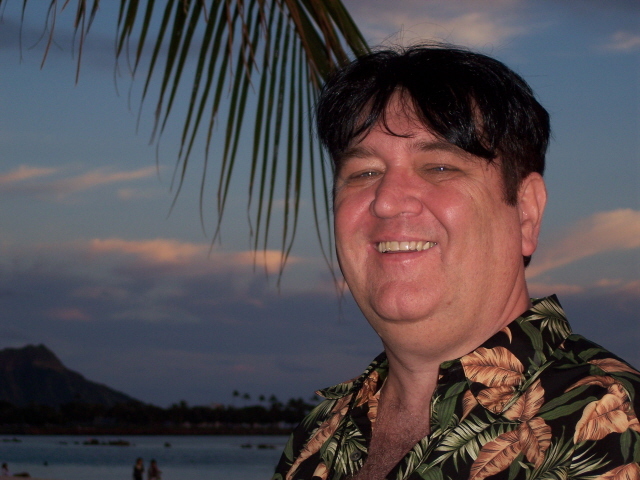 I've love writing and developing websites and I love Hawai'i. I do have over 200 website's running, some I've not looked at in a couple years or so. I like to put things together and educate people in how to get more value for their money. I spent many years with the Air Force writing programs and putting lesson plans together and then teaching personnel how things work in a formal classroom environment. I also have an extensive background in medicine with an emphasis in Cardiothoracic Surgery. I've worked in some of the top hospital in the country, and I try to help the sick and disabled, buy also teaching them to live better by applying and practicing more efficient life-sustaining techniques. As of January 11, 2008, I was 53 years young. Black hair, blue eyes, and a huge Elvis Presley fan. I have been on stage a time or two in the past myself, and I was not kidding when I told Don Ho I would not leave the stage if I ever got up there. I plan to keep on keeping on and to do my rocking the stage. My middle name is really Joe and I do live on the Island of O'ahu and that's how the name Hawaiian Joe came about. I registered it, Incorporated it, and Trademarked it. I take exception to what, in my opinion, is wrong doing. I'm very opinionated as you may have already figured out, and I fight for the weak or the disadvantaged. It frustrates me to no end to see people being taken advantage of. It frustrates me even more when people try to take advantage of me personally. I have had by shares of misfortune just like everyone. I've been lied to, stolen from on numerous occasions, been in several wars, bled severely twice, but never ran from nothing. The Good Lord always gave the the ability to adapt and overcome. So, I keep on keeping on. For those that do not share my opinions, that's certainly your right. I do however, wish you the best in your endeavors.